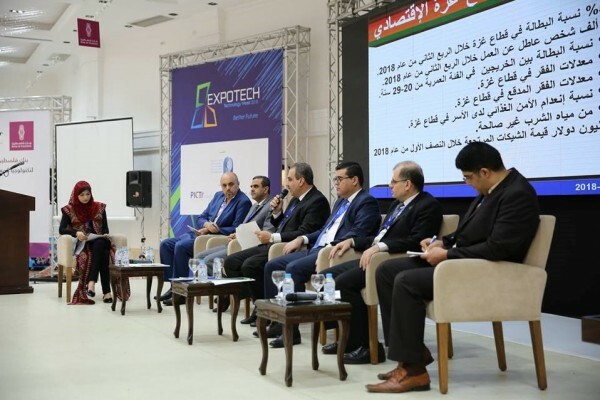 number of Palestinian experts in the Gaza Strip,stressed the importance of the role of technology in thedevelopment of economic sectors and to increase employment opportunities and contribute to the reduction of bloated unemployment rates in the sector. The discussion included strategic and leadership sessions on the role of technology in the development of economic sectors, the latest economic statistics related to the Gaza Strip, the current situation, positive indicators of economic development and the current trends in the development of the software system in the sector. And ways of economic development through networking and coordination with different sectors and ways of maturity to convert operating projects from temporary projects to production projects. She opened the M. Lina Shamia, Regional Director of the Information Technology Association (PITA). The session discussed the role of technology in the development of economic sectors and increase employment opportunities, which was attended by a large number of experts, specialists and corporate managers. Abu Ghazaleh stressed that the future of the invention of knowledge and information and communication technology, and that any siege or injustice or suffering should be turned into an incentive for victory, and that the historic opportunity to win is using the techniques of knowledge and technological development. He explained m. Suhail Madoukh, Undersecretary of the Ministry of Communications and Information Technology that the unemployment rate in the technological sector reached 55%, indicating that the unemployment rate among young men more than among girls, where the unemployment rate among males is 35%, while girls 83%. Turning to the Indian model as one of the most successful global models in the IT sector, with an annual income of $ 460 million per year, they are well-informed based on investment in the human mind. industrial sector has worked extensively to absorb the labor force. He emphasized this trend through implementing a project with UNDP in cooperation with the Islamic Bank to establish an incubator to help young people to be entrepreneurs and creative ideas. Mr. Omar Shamali, Director of the Gaza Region Department of Jawwal, stressed that the telecommunications sector is one of the largest contributors to the technological sector’s output and contributes to the local economic development and business environment. For his part, economic experts Saifuddin Odeh and Maher Tabaa talked about the latest economic statistics related to the Gaza Strip in terms of economic growth and employment, positive indicators of economic development, the most important sectors of the economy that are receptive to the integration of technology, in addition to the contribution of software to increase and improve the productive quality of the service and commercial sector. Mohammed Abu Zaiter launched a project for graduates of information technology by providing direct employment opportunities and opportunities for them within private sector institutions and supporting incubators and pilot projects to achieve the goal of this project. He stressed that there is a big gap between the graduates of technology and the labor market. This is due to the lack of coordination and follow-up between different parties. Bassil Qandeel, Director of the Business Incubator at the Islamic University, reviewed the projects of Palestinian incubators and their role in sponsoring and developing projects and ideas in Gaza. He stressed that the environment supporting the emerging projects is still incomplete, and the various parties must work to recruit the necessary funding as a way out of economic collapse and the accumulation of unemployment and create hope for generations of graduates. On the sidelines of the meeting, the agreement was signed to establish an information technology database with private sector leaders, in order to activate more graduates of information technology and will benefit individuals and companies. The meeting concluded with a number of recommendations and innovative solutions in terms of technology utilization in the local economic development in Gaza. topic. Will artificial intelligence affect positively the chances of economic development beyond its negative impact on employment opportunities? Where he confirmed. Mohammed Al-Astal stressed the importance of benefiting from the huge investments in artificial intelligence and potential development opportunities, pointing out that this opportunity is cross-border and very suitable for us in Palestine, and we need only to Preparation the expertise and academic knowledge only. And m. Ahmed Abo Shaaban, the academic economist that artificial intelligence in light of the decline of our marketing capabilities, the low level of prices and export revenues and the fragile economic situation will not be an economic option for economic establishments because it is unprofitable and does not bear economic cost at the level of projects. Mohammed Al-Nunish, one of the founders of Iris Solutions in the West Bank, who spoke via Skype about how to integrate modern technology in the tourism field, said a number of achievements such as the introduction of interactive screens in museums such as Yasser Arafat Museum in Ramallah and the Jenin Tourist Center. Al-Nanneesh talked about the obstacles facing the technological sector, the most important of which is the difficulty of introducing raw materials, where the occupation imposes a lot of licenses and weak funding for start-ups. Speaking m. Mahmoud Al-Jabri, a development and entrepreneurship expert at Clasera, explained the company’s experience in the field of educational transformation, which included, according to the elements of the success of the educational transformation, which included professional development, assessment of the curriculum, information environment, simulation, research and evaluation. He stressed that competitiveness today depends mainly on the skill of the workforce and graduates in the field of technology, pointing out that all investors today before starting any international investment look at indicators of technical education and skills within the country to be invested, and if the skill exists, There were no new investments. Al-Jabri called upon the competent authorities in the Palestinian and Arab countries and governments to work to develop educational systems and pay attention to the technical outputs and the real scientific skills, and give them to graduates and national companies and institutions to achieve the aspirations of international companies in production and work on the technological, programmatic and industrial levels. On the other hand, Eng. Said Al-Aga, CEO of WordPressNet for Programming and Networks, delivered the second paragraph of the third session, in which Mr. Abdul Hadi Odeh, HP’s global official, talked about the company’s experience in Palestine. Abdul Hadi stressed that HP is a major practical, scientific and technical lever in the development of the most vital sectors in Palestine, foremost of which is the banking market, which is considered one of the best technological and service systems in the region compared to Arab banking systems in neighboring countries. He also pointed out that the health and education system in the territories of the Palestinian Authority is a great success story for HP, which oversees all the technical and software details of the work of these institutions. He revealed the close of the arrangements for the establishment of Data Center for the Palestinian Telecom Group and the implementation of HP International, which will constitute a quantum leap in telecommunications services in Palestine.